A Gallery is a collection of images or photos for exhibition to the public. Gallery allows you to have unlimited photo albums. Administrator can maintain the whole Gallery site through the administration area. Gallery is free and available for the public to use. Gallery supports over thirty languages. The album is a collection of pictures or multimedia files inside a gallery. The album over can set the permission for each album. The albums can also be hidden from the public view and only available to registered and login users. You can set the caption of each image in the album without having to click on it. Moderators can review each comment in one place. The images and multimedia files in the album can be arraged according to the date added, date capture, and etc. You can also enable polling for each album. The result of the polling will be shown on top of the page. The album can be watermarked. Users can customize all the aspects of the album including title, colors, background, etc. Users can also the thumbnail size and target photo size. You can add photos to an album by uploading a zip files full of photos or use the web form to upload 10 photos as once. Alternatively, you can upload the photos to the appropriate directory through an FTP program. Click on Gallery in the Image Galleries section on the left Navigation bar. Select the domain on which you want to install Gallery from the Install on domain drop down menu. If you want to install Gallery in the root directory of the domain, leave the Install in directory text box empty. If you want to install Gallery in a directory, enter the directory name. This directory should not be existed. It will be automatically created. Enter a username in the Administrator-username text box. You need this to enter the Gallery administration area. Enter a password in the Password text box. You need this to enter the Gallery administration area. Enter your full name in the Admin full name text box. Enter your email address in the Admin e-mail text box. Select your preferred language from the Preferred Language text box. When you are done, click the Install Gallery button. Gallery is now successfully installed. 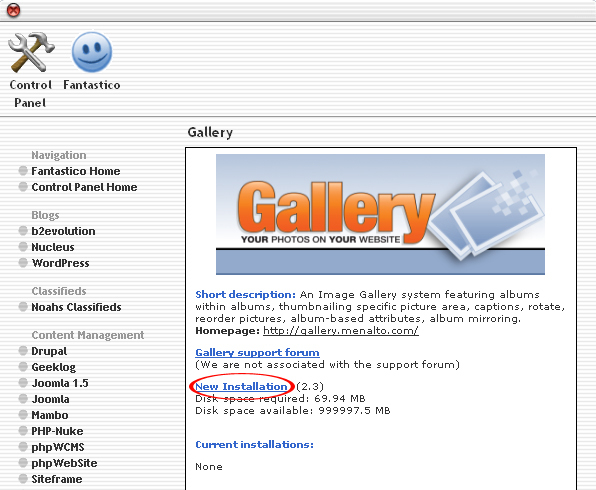 If you follow the instructions above, you will be able to install Gallery on your site through Fantastico in Cpanel.